The new Republican majority in the House decided to begin today’s session with a reading of the constitution. It is something that has never been done before, and something that has sparked much controversy and debate. I, for one, am ecstatic. The Republicans have finally gotten around to reading the constitution, although it is interesting that they are choosing to all do it at once. I’d say it’s either part of those new austerity measures, in this case saving time (and time is money, brilliant! ), or it is meant to save certain illiterate republican politicians from the embarrassment of admitting they can’t read it on their own, which is quite possibly why this idea originated with the new Tea Party endorsed candidates. Alright, in all seriousness I do believe that reading the constitution on the floor of the house is a good idea. I’m probably a hopeless idealist, but I’m a big fan of the constitution and part of me thinks that maybe our politicians hearing it and even thinking about it might do some good. First of all, it can’t hurt. It might waste time but it’s a better waste of time than many other things the House of Representatives wastes time with, such as trying to repeal the new health care reforms or allowing Congresswoman Michele Bachmann to open her mouth. It is true that it is a political ploy by the Republicans to appeal to their new friends in the tri-corner hats, but nothing gets done in Washington without a modicum of political incentive. It is a given that it is done for political reasons, so the real question is will it do more harm than good, and the answer is probably not. 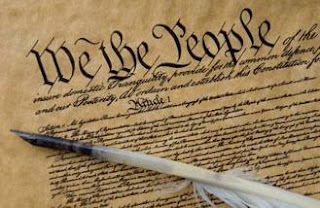 Second, the Constitution is a very important document that serves as the foundation for the rule of law in our nation. It is a document that ought to be read in government chambers and that every U.S. citizen, and especially our political leaders, ought to be familiar with. I am also glad that the “amended” version was read. This version was read rather than the original because politicians were uncomfortable reading the passages related to slavery, but the real reason that the “amended” version should be read is because it is the CONSTITUTION. The Constitution of the United States of America is what’s known as a living document; it can be amended, in fact the document itself contains provisions that prescribe the procedure for amending it. So the “amended” version, the current embodiment of this founding document, is the supreme law of the land and the version that should be read. The original version penned in Pennsylvania was brilliant and has survived for the most part, but the improvements that have been made and the modern interpretations are what we have to go by. It is a great idea to read the constitution, but Republicans should realize that when they say they want to follow the Constitution doing so includes following the sixteenth amendment as well as the entire second amendment, rather than just the second half of it. Third, this means that when politicians incorrectly, whether intentionally or not, invoke the constitution in debating legislation they can be held more accountable. As bad as it is that our politicians frequently misquote or misrepresent the Constitution, it will be worse when they do so after we all know for certain that they had it read to them at least once. I’m not naïve enough to think the truth of the constitution will sink into all of the thick skulls on each side of the isle, but I think we can expect some improvement, however slight it may turn out to be. That’s why I think it was a good idea. I believe that whatever their reasons the new Republican majority has at least done one thing right. We’ll see how long it takes for a second good thing to emerge from the House under its new management.